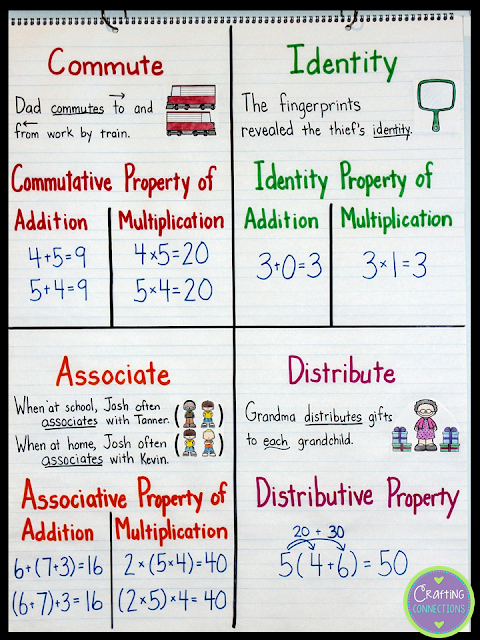 Commutative, associative, distributive... the math property terms can be a bit intimidating for elementary students being introduced to the addition and multiplication properties. I know some teachers who rename the commutative property the "flip-flop property", but personally, I'm not a big fan of renaming challenging words. A few years back, I was helping one of my ELL students complete a math assignment. She was supposed to match the equation in Column A to the addition property that was being modeled in Column B. When she saw the problem (5 + 8 = 8 + 5), her eyes lit up and she said, "Oh, I know this! It's the flip-flop property!" Of course, she was exactly correct... but "flip flop property" was not one of the answer choices. She sat there, tapping her pencil to her lips. I read the answer choices to her, and told her that one of them was the official word for "the flip flop property". Clearly taking a random guess, she pointed to one of the words and asked, "Is it this one?" As an ESL teacher, I strongly believe in teaching students strategies that will help them decipher meanings of unknown words- whether it's by using context clues, finding a base word, or looking for a root, prefix, or suffix. In terms of learning the math property words, finding a base word is the ideal strategy. 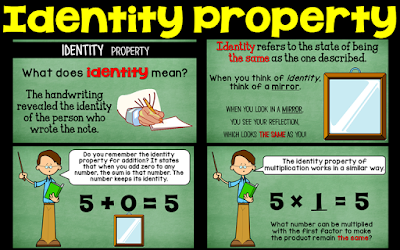 The anchor chart below shows how I extract the base words and place each within the context of a sentence to help students make a meaningful connection between the word and the meaning of the property. I also like to attach each property to a visual cue (another ESL teaching strategy) to deepen the connection. If you would like to create this anchor chart yourself, click HERE. 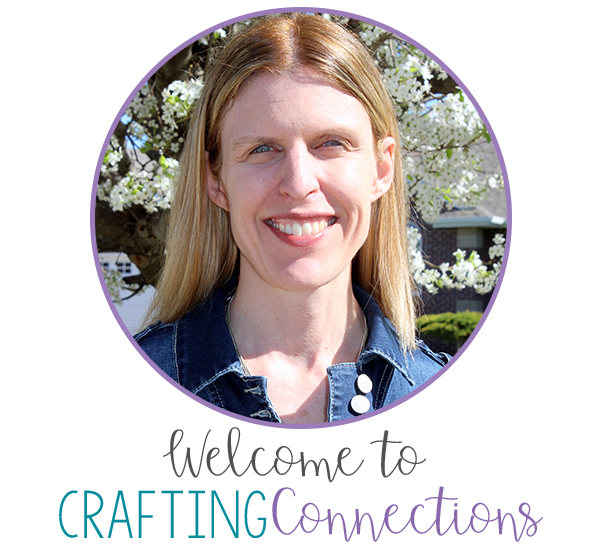 If you print page 2 of the preview, you can color and cut out the images (by Educlips and A Sketchy Guy) on this page and use in on your anchor chart. I recently created two math property PowerPoints (one for addition, and one for multiplication), and I used the same method described above. These slides show how I introduced each term.